A man hugs a woman outside the Alamo Gym where parents wait to reunite with their kids following a shooting at Santa Fe High School. 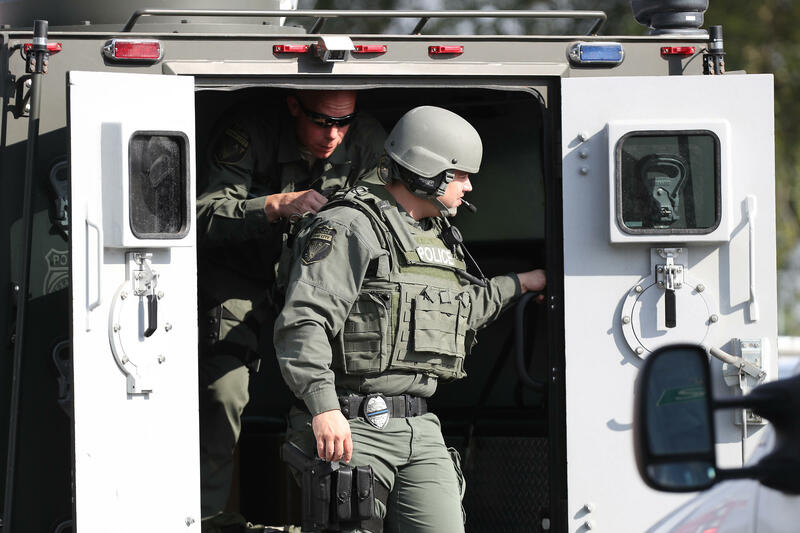 Emergency responders respond to an active shooter. Law enforcement officers respond to Santa Fe High School after an active shooter was reported on campus. Mourners gather by the Barnett Intermediate School where parents are gathering to pick up their children and hear news. 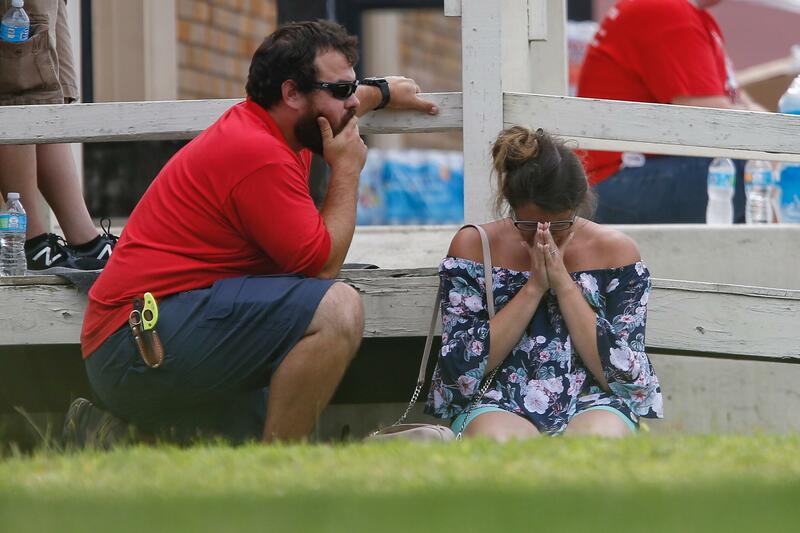 A woman prays in the grass outside the Alamo Gym where parents wait to reunite with their kids following a shooting. Emergency responders from multiple agencies work at the scene. A women receives information regarding the active shooter. People embrace outside the Alamo Gym where students and parents wait to reunite. 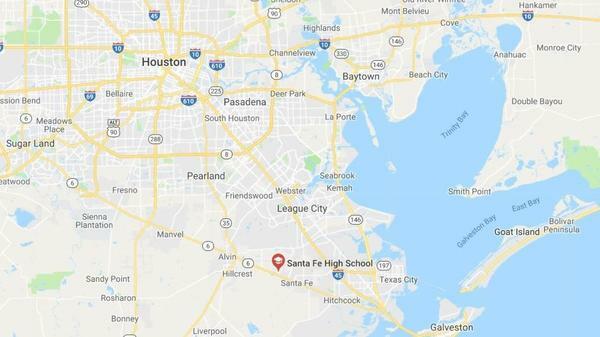 Police were called to Santa Fe High School after shots were reportedly fired on Friday morning. A 17-year-old suspect is in custody and being held at Galveston County jail without bond, school district officials said in tweet, adding that the alleged shooter is being charged with capital murder and aggravated assault of a peace officer. School district officials identified the suspected shooter as Dimitrios Pagourtzis, a current student at the school southeast of Houston. Citing evidence from the suspect's journals and electronic media at a news conference, Abbott said Pagourtzis had plotted to carry out the attack and then die by suicide. But he surrendered instead. "He gave himself up and admitted at the time he didn't have the courage to commit suicide," Abbott said. A second person was also detained for questioning, police said, and a third who police said had been acting suspiciously was also being interviewed. A shotgun and a .38-caliber revolver — neither of which was owned by the suspect — were used in the morning shooting. The weapons were legally owned by Pagourtzis' father, Abbott said. 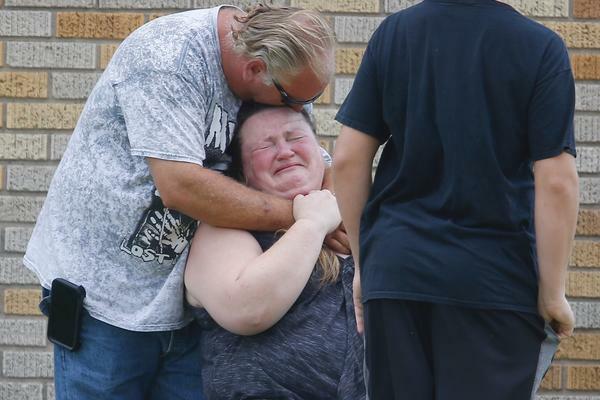 The Associated Press identified one of those killed as substitute teacher Cynthia Tisdale, whose niece Leia Olinde tearfully remembered Tisdale helping her shop for a wedding dress. "She was wonderful. She was just so loving," Olinde said. The embassy of Pakistan in Washington, D.C., said one of the students killed was Sabika Sheikh of Pakistan, who had been participating in a U.S. State Department-sponsored student exchange program. The embassy said its consul general in Houston was touch with authorities. Hours after the violence unfolded inside the school, news of another potential threat emerged. The Santa Fe Independent School District announced, "Possible explosive devices have been located at the school and off campus." Police are "in the process of rendering them safe," the district said, adding that the school had been evacuated. 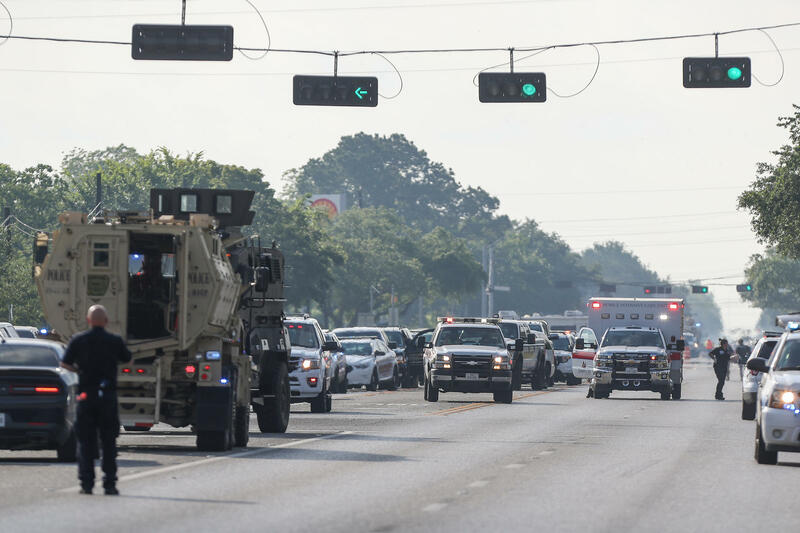 Law enforcement officers have warrants for two residences that have been linked to the suspect, Abbott said at the afternoon briefing, but efforts to search them have been slowed by concerns that the properties might have been booby-trapped. Describing explosive devices that had been found, Abbott said a "CO2 device" and a Molotov cocktail were among the devices that had been spotted in both a home and a vehicle linked to the case. Santa Fe Independent School District officials announced all campuses will be closed Monday and Tuesday. By late afternoon, school officials had begun the process of reaching out to families in the community, an attempt to provide some comfort. "As I write this message, our campus remains an active crime scene," Superintendent Leigh Wall wrote. "I want you to know that we will gladly accept every resource that will help our students on what promises to be a long road to recovery. Your children's needs — emotionally, spiritually and physically — will be met by those who are best equipped to do so," Wall said, referring to the outpouring of support the district had received throughout the day. At least one vigil has been in Santa Fe. Santa Fe is a city of some 12,000 people and sits between Houston and Galveston. In addition to police from the city and school district, the investigation involves both state and federal authorities, including the FBI. 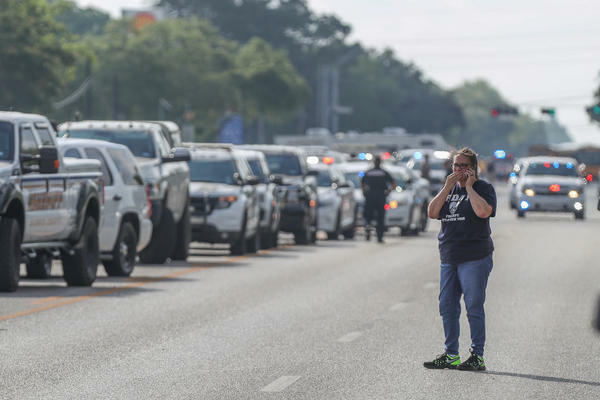 The shooting reportedly began before 8 a.m. local time, putting the school on lockdown and sending police rushing to the scene. Several witnesses said the attacker was armed with a shotgun; reports also said he had several weapons. After announcing news of the shooting, the school district issued an update stating, "This morning an incident occurred at the high school involving an active shooter. The situation is active, but has been contained." As the situation unfolded, several ambulances and Life Flight medevac helicopters were called to the location, and a stream of them was reportedly seen leaving for nearby hospitals. 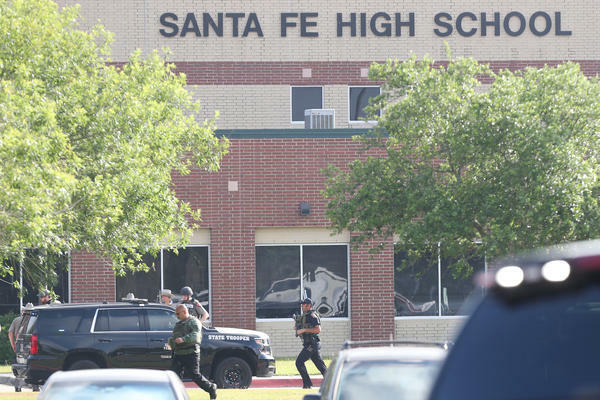 Harris County Sheriff Ed Gonzalez said that one officer from the Santa Fe Independent School District Police Department was injured and is being treated at a hospital. He did not have details about that officer's condition. Before Abbott's update, area hospitals had said that they had received at least 12 people from the school. The Clear Lake Regional Medical Center said that two of its campuses have together taken in nine patients. The University of Texas Medical Branch said it received three patients — two adults and one person under 18 years old — from the shooting. One of those patients, a middle-aged man with a chest wound, is in critical condition, according to Raul Reyes, the hospital's director of media relations. The other two people had been shot in the leg, he said. A student at the school told local TV station ABC 13 that she had been sitting in art class when someone entered with a gun and began firing. The student said that she fled and that she saw a student who had been wounded in the leg. Another student, named Paige, told the station that she was in a classroom a few doors down from where the shooting started. "I heard really loud booms, and I didn't know what they were at first," she said, saying she realized what the sounds were after she heard students screaming. Paige said she and others took shelter in an area behind a stage after being told to wait before trying to leave immediately. The student said that she and others had trouble staying calm but that there was not a moment when she felt like what was happening wasn't real. "It's been happening everywhere," Paige said. "I always felt like eventually it would happen here. I wasn't surprised; I was just scared." While some students said the sound of gunfire alerted them to the danger, others said they fled the building after a fire alarm was pulled. Bree Butler, a senior at Santa Fe High, told NPR's All Things Considered, "I'm so glad that so many kids got out safe. Whoever pulled that fire alarm honestly saved so many people's lives." She and her classmates had been working on a European history project, Butler said, when a teacher ran down the hall, yelling. It immediately got their attention. "We shut the lights off, and we shut the door," Butler said — but after the fire alarm sounded, they debated whether to leave, thinking the alarm might have been part of a gunman's plot to flush people out of classrooms. That's when another teacher came in the room with a clear message, she recalled: "You need to get out." Butler says the class made its way to a field behind the school, and she was able to find her younger sister, who had been in a classroom closer to the shooting. They eventually reunited with their mother, who took a group of students back to her house. The same school was the site of a false alarm about a shooting back in February. In that case, students and teachers reported hearing "popping sounds" outside, as Houston Public Media reported. Discussing the shooting at the White House, President Trump offered his condolences and said his administration was monitoring the situation and that federal agencies are working with local authorities. "This has been going on too long in our country. Too many years, too many decades now," Trump said, according to a pool report. The president added, "My administration is determined to do everything in our power to protect our students, secure our schools and keep weapons out of the hands of those who pose a threat to themselves and to others. Everyone must work together at every level of government to keep our children safe." The students behind the March For Our Lives movement, which started after the Marjory Stoneman Douglas High School shooting in Florida, sent a note of support, saying, "This is the most fatal shooting since the one at our school and tragedies like this will continue to happen unless action is taken." One of the leaders of the group, Emma Gonzalez, added via Twitter, "Santa Fe High, you didn't deserve this." As students exited Santa Fe High School, they left behind their backpacks to be checked by police and then filed onto a nearby grassy area alongside a row of school buses. Images from the scene showed some students being searched by officers. 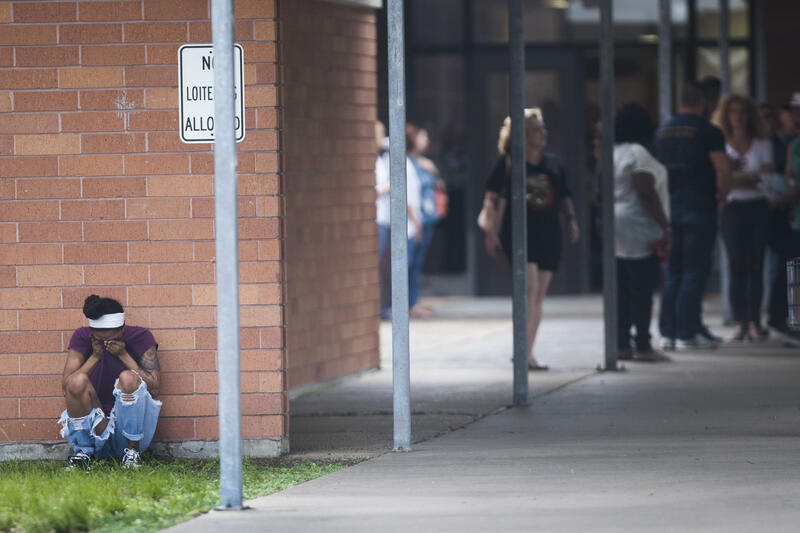 Speaking to media Friday afternoon, Abbott said it was "one of the most heinous attacks that we've ever seen in the history of Texas schools. 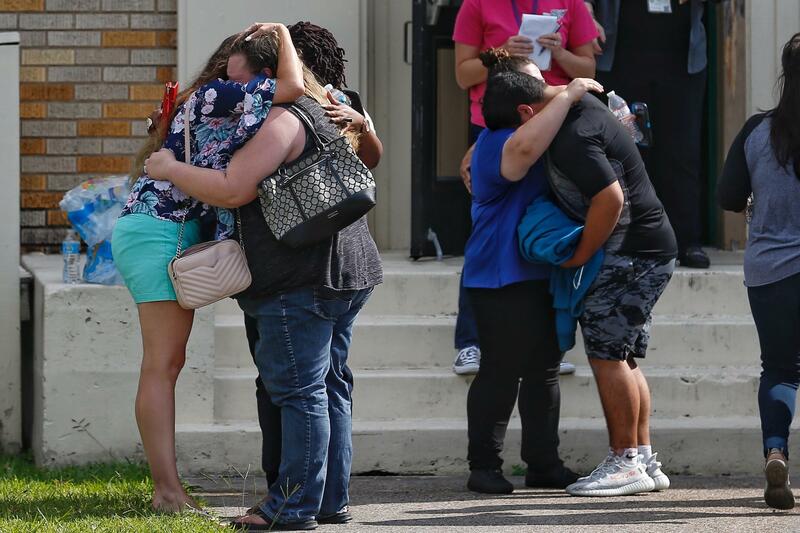 It's impossible to describe the magnitude of the evil of someone who would attack innocent children in a school, a place of learning where parents should be able to send their children without fear for their child's safety." Abbott asked for "prayers and support" for the families affected by the shooting. But he later added, "We need to do more than just pray for the victims and their families. It's in Texas that we take action, to step up and make sure this tragedy is never repeated." The governor said he would meet with legislators and community members to begin "roundtable discussions" about "swift solutions to prevent tragedies like this from ever happening again." The goal, he said, will be to create laws that respect the Second Amendment while also speeding up background checks and finding ways "to keep guns out of the hands of those who pose an immediate danger to others." This is a breaking news story. As often happens in situations like these, some information reported early may turn out to be inaccurate. We'll move quickly to correct the record, and we'll only point to the best information we have at the time.